Today we are going to see a crazy lapel choke from a purple belt named Toby. He trains at Gracie United Brazilian Jiu Jitsu in Baton Rouge, Louisiana. I just completed a seminar here and I rolled with Toby. He tried a choke on me from half-guard that I had never seen before. He almost tapped me out with it. The only thing that saved me was that I got four fingers inside my lapel to release the pressure. It was a very tight choke. I really like this position so let’s see how he does it. He starts off playing half-guard with a knee shield. He opens his opponent’s opposite lapel and grips it. Also, he likes to get a sleeve grip on his opponent’s other arm. He pulls his opponent towards him using his knee shield leg to help. He puts the lapel he is controlling over his opponent’s head. Then he loops his forearm to the other side of his opponent’s neck. Next Toby uses his foot to kick on his opponent’s knee to scissor sweep him over to his back. He pins his opponent’s forearm with his knee. To finish the submission, he uses his forearm to push into his opponent’s neck. 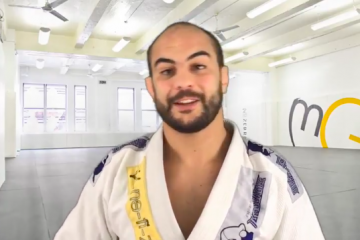 I recently wrote a blog about how in Jiu Jitsu we can learn from anybody. The belt level doesn’t matter. Toby isn’t a professional grappler, however he almost tapped me out with this technique. When I train I never worry if someone taps me out. I was lucky to get my fingers inside my lapel to save me. I am very impressed with this crazy lapel choke from a purple belt. This is one of the things that is so cool about jiu jitsu for me. I truly believe we can learn new details or techniques from any belt level. Everybody does at least one position better than we do. I think the most important detail about this position is when he loops the lapel around my head and he passes his elbow over my head. When he did this to me I realized it was too late. I was in big trouble. Then he brought his elbow in tight and swept me. As I said, when I went to my back I was lucky to get my four fingers inside my lapel to decrease the pressure allowing me to escape. Another thing interesting for me about jiu jitsu is that we never know what is coming. For example, I came here to teach a seminar and I almost got submitted by a purple belt with a technique I had never seen before. Toby starts playing half-guard with a knee shield. He opens his opponent’s opposite lapel and controls it. He also grips his opponent’s sleeve with his other hand. Now he pulls his opponent forward and puts the lapel that he is controlling over his opponent’s head. He then brings his forearm to the other side of his opponent’s neck. Next he kicks out his opponent’s knee and sweeps him to his back. Then he pins his opponent’s arm using his knee. To finish the submission, he uses his forearm to push into his opponent’s neck. I hope you all enjoyed this crazy lapel choke from a purple belt named Toby. Thank you Toby. Oss.